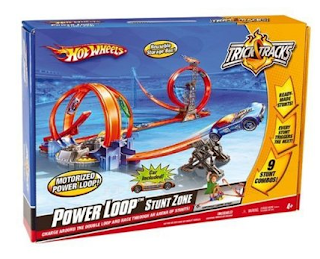 Now that my son has figured our how to play with toy cars, we thought it would be a good idea to try Mattel’s Hot Wheels Power Loop Stunt Zone. This cool toy caught my eye because of all of the loops and fun stuff that the cars can do. After getting it together, which was not as tricky as I thought it was going to be, this cool track was definitely a child pleaser. As mentioned, this set needs to be assembled. Mattel’s easy to understand instructions paired with a track that easily slides together make this a pain free process for parents. Before letting my son loose on this cool track, my husband needed a few minutes to get acquainted with how everything works. 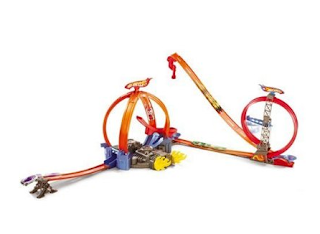 The Hot Wheels Power Loop Stunt Zone comes with one car, but it is more effective with 2 or more. If you are planning on purchasing this for a child make sure you pick up an additional car right from the get go so that use the track with their friends. This adrenaline powered toy offers everything that little boys love – speed, excitement and stuff flying through the air. My son, who has the very low attention span, could play with this toy forever. We plan on purchasing some of the add on sets to to expand the excitement and life of this cool toy.